← Verbatim Introduces New Store ‘n’ Go V3 USB in 7 Colors! Those who travel often for work or pleasure would go an extra mile just to make sure their valuable data is secure. Cloud hosting is a good option, but hackers have increased the risk of stolen data when saved on a PC. Because of this, USB storage solutions have become the better option. The Apricorn Aegis Padlock Pro SSD is promising to offer more than great storage – they offer beautiful security and peace of mind. Encrypted drives protect against loss or theft of data. An effective encryption has to be difficult, but should encryption be as hard to the owner as it is to hackers? The new Aegis Padlock has a simple aim – to make access to your drive easy and convenient using your own pin. 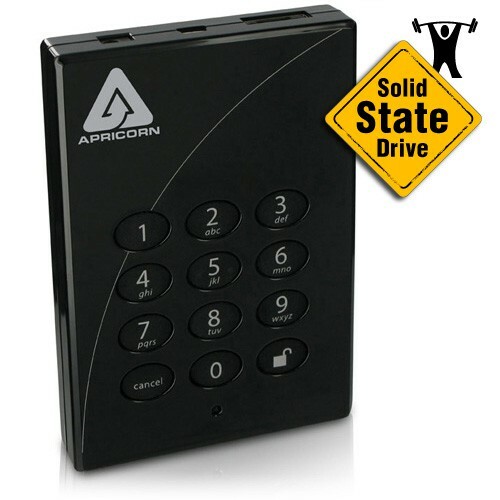 The Apricorn Aegis Padlock Pro SSD measures 4.7 inches x 3.3 inches, and weighs 6.2 ounces. On first look, it could be mistaken for a cell phone because of the keypad that it features. Just like security door locks, this 12-number keypad on the front will help the user unlock the encryption. The glossy black plastic cover gives a sleek, professional appearance with a white stripe running diagonally to add a little zoom. The keypad buttons are water resistant – this helps prevent the keys from wearing out and makes it difficult to know which numbers are used to unlock it. This USB 2.0 device can stand the test of temperatures ranging between 40 to 158 degrees Fahrenheit, according to Apricorn. This solid state drive is shock resistant, too. And since it is part of USB technology, it can easily transfer data using the USB cable that comes with it. Featuring USB 2.0, the device promises speedy data transfers. This comes handy as no software is required for this SSD to work with your PC or OS, and makes it easy for any user, new or old. The Apricorn Padlock uses a FIPS PUB 197, which is a military grade validated encryption algorithm. You have your choice between AES-128 or 256-bit hardware encryption. Plus, with its real time encryption capabilities, PINs and encryption keys are always encrypted even while the USB 2.0 device is idle. Can a hacker attack the device physically? Certainly not, according to Apricorn, who said that the tough epoxy coating of the SSD makes it virtually impossible to damage without it being totally and completely destroyed. Finally, there’s the Brute Force Self Destruct feature which makes data three times more difficult to hack. The Aegis Padlock automatically locks itself after several failed pin attempts, then after a certain number of failed attempts it will assume that it is being attacked. When this happens, the device will destroy the encryption and reset the SSD so that no data is left for the attacker. This is an overall great device that can keep all your data safe and protected. However, data protection of this kind comes with a price. The Apricorn Aegis Padlock costs $759 for the 256GB pro SSD or about $2.96 per gigabyte. High security definitely isn’t cheap. But do you think this price is worth the features of the device? Don’t forget to share your thoughts with us! This entry was posted in Aegis Padlock, Articles, External Hard Drive, USB encryption, USB Storage Drives, USB Technology and tagged Aegis Padlock, Aegis Solid State Drive, Apricorn Aegis Padlock Pro SSD, Encrypted drives. Bookmark the permalink.